Right, this bit is new for me. I have the mould ready on the floor. Next to it is an old metal biscuit tin full of sand, ready to receive any excess metal (note to future self: use a muffin tin instead. I ended up with one huuge ingot which is too big for my crucible!). Everything is sitting on top of a sand pit. 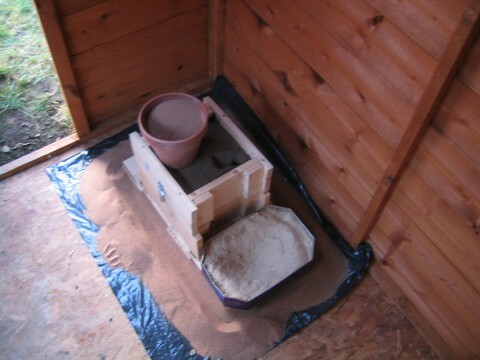 There’s a black binliner on the floor, so that it’s easy to clean up the sand afterwards. There’s a good inch-thick layer of sand on top of it. Molten metal doesn’t “soak through” sand (that’s why we can use sand moulds) so there’s no risk that spills will reach the wooden floor. I made a little moat in the sand, running round the outside of the sand pit. This stop any molten metal from dribbling off the edge of the sandpit onto the floor. I was aware of the risk that the molten aluminium might push the two halves of the mould apart, and was basing my safety precuations on that (bad) eventuality. Just out of shot is a powder fire extinguisher. You can also see a flowerpot full of dry sand, ready to deal with any conflagrationary occurances. Originally, I was going to use the flowerpot to weigh down the mould, but in the end I moved it and used some scrap metal instead. This gave me easier access to the mould when pouring.